De’Longhi is an Italian manufacturer that has been been making small appliances since 1902. Needless to say, they know what they are doing. If you scoffed at the $60 Mr. Coffee espresso machine that was on sale at Best Buy the other day, then perhaps this is the version for you. 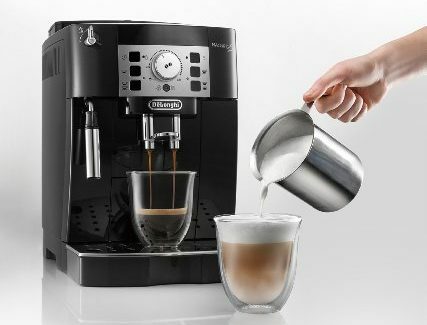 Normally, $900, the De’Longhi Super Automatic Espresso, Latte and Cappuccino Machine is on sale for $499.95. It is one of the most popular espresso machines on the market, and for good reason. Unlike other coffee makers, with the De’Longhi you have more control over what kind of coffee you get out. Input any type of beans you want, and the machine will grind them for you. Then, pick the strength of coffee you’re looking for and whether you want froth. Voila! Your drink is complete. Everything about this machine is elegant and simple. There is no fidgeting with buttons and controls. Each command is controlled by a single touch, and the coffee will be fit to your tastes. This is a good addition to any home or office, and although it is definitely worth $900, that can be a lot of money for something like this. Getting it for under $500 is definitely a steal. Saving $400 on something I would use every day? Sign me up.